XOLO has quietly listed a new Android smartphone on its official website, which comes with water and dust resistance. Dubbed as Q700 Club, the phone has been priced at INR 6,999 and will be available in the coming days. The XOLO Q700 Club sports a 4.5-inch FWVGA display and is powered by 1.3GHz MediaTek MT6582M quad-core processor. In addition, XOLO has included 1GB of RAM, 8GB of internal storage and microSD card slot on the smartphone. Among other specifications, the phone comes with 5MP auto-focus rear camera with LED flash and VGA front shooter with operator video-calling support. The phone runs on Android 4.4.2 and comes pre-loaded with Hungama app with free unlimited music and video downloads for 3 months. 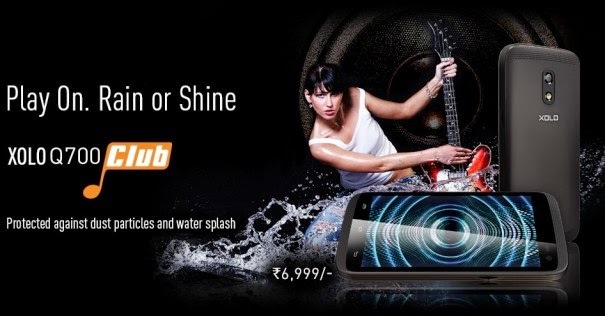 The XOLO Q700 Club will be released in Black and White colour options.